Jan van Eyck's famous portrait of a man and woman is a wonderful example of an artwork replete with symbolic devices. Writers through the ages have attempted to piece these together into a unifying construct, to best suit artistic conventions of van Eyck's era, as well as the documentary evidence surrounding the figures depicted. Among the more notable interpretations, the readings by Erwin Panofsky and Lorne Campbell are the most widely known. On display at he National Gallery London, this piece is currently titled The Arnolfini Portrait. This is a succinct and accurate descriptor. 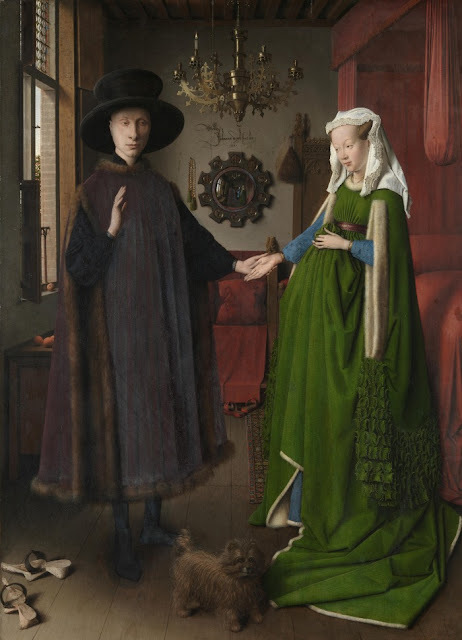 Over the years, a number of titles have been given to the piece, such as The Arnolfini Marriage, which is largely in keeping with Panofsky's interpretation of this painting as a notarised marriage contract. Art historians often bicker about these arbitrary names assigned to works - time perhaps better spent contemplating why they are bickering in the first place. Are they really arguing over facts, or their interpretation of these facts? Margaret Koster's reading was introduced in an Apollo magazine article in 2003. Koster remains elusive to track, and can generally be categorised as an art historian with a very minimal web presence. The focus of her work in recent years has been Hugo van der Goes, a less well-known, but equally fascinating figure in late Medieval and Early Renaissance art. Via the web, and Waldemar Januszczak's documentary Every Painting Tells A Story, a growing number of people have become aware of this unique interpretation. Koster also appeared in the BBC documentary Northern Renaissance, hosted by art historian Joseph Leo Koerner (incidentally, Koster's spouse). Although these documentaries have helped promote Koster's work, the immense popularity of this work and the great interest in deciphering meanings in art result in a frequent discussion of this piece in scholarly circles and online. Web articles and blog posts discussing The Arnolfini Portrait are common, one was featured here in 2009, and some of the more notable recent efforts have been by art historians Monica Bowen and Gina Collia-Suzuki. Each present useful summaries of interpretations and pertinent facts, laced with a degree of revelation regarding which aspects of these theories sit best with them. Factors they omit, or fob off to a Google search reveal as much about the outlook of the author than the facts presented in the actual piece. This goes beyond the context of weblog posts, where there is a predisposition to express personal views - this personalised language is seen in many texts, traditionally in monograph style presentations or journal essays such as Koster's piece in Apollo. We can only surmise this is related to factors of training. I clearly remember the grind of scientific writing classes, where we actively studied the reporting of medical information succinctly and without emotional biases. This has clearly filtered into my own writing on the topic of art history. Unlike other commentators, I do not have a reading of choice when it comes to the The Arnolfini Portrait. I very much enjoyed Koster's article for its historical thoroughness but have no attachment to it over Panofsky or Campbell, regardless of the factual inconsistencies. The most interesting consideration here is what the various interpretations of The Arnolfini Portrait can tell us about the process of studying, and teaching art history. Of greatest concern here is an observer bias that filters into teaching and popular conception. What are commonly described as 'facts' are presented in segregation from other relevant pieces of information. It can be argued that just as art historians try to establish an historical timeline for the work in a physical sense, known as provenance, a parallel interpretative timeline is just as important, as this is the best reflection of the state of art historical discourse at that given time. Whilst remarkable for many reasons, Koster's Apollo piece is quite combative in places. Her comments on Panofsky must be viewed in a broader context. Rather than state her reading is created to undo Panofsky's work, I would like to submit that it fits quite well into Panofsky's 3 layers framework. Defining the broad cultural context of symbols used. eg. The dog was commonly used in art of this period as a motif for death, as well as loyalty. The artists interpretation of the symbols - considering social, historical and technical aspects of the work. eg. As per Koster's reading: A memorial portrait commissioned by Italian merchant Giovanni di Nicolao Arnolfini, in memory of his wife Costanza - arrangement of symbols in the Passion scenes of the mirror, the snuffed candle and St. Margaret motif (etc.) have been deliberately placed by the artist to denote a set of events affecting the lives of the persons depicted in the work. When first proposed, Panofsky was attempting to introduce the concept of Iconology which was used to describe the third layer, differentiating it from the traditional meaning of symbols or Iconography in layer 2. This is confusing and unnecessary. Hence rather than discard his framework completely, we can use a succinct revision of it as outlined above. It is incorrect to assume that this is a purely historiographical approach. It is not all facts, figures and documentary correlations - but the psychological and social impetus behind a work's creation should not be ignored. It has become increasingly the case to focus on technical and documentary evidence to support an interpretation. This is undoubtedly important, but also is missing an element of emotional and intellectual resonance these pieces were designed to create. This can only be captured via a more philosophical discussion. As discussed previously, some art historians have a tendency to proceed in an adversarial manner, demanding their findings are seen as the dominant, correct or ascendant version. This may be applicable for quantifiable phenomena, as measured in the sciences, but when the human creative spirit is engaged, some room must be left for the contemplative facet of a work. This is the essence of Michael Fried's absorption and theatricality, or Simon Abrahams on artist self representation. These approaches to art history, particularly with regards to the Renaissance and Baroque are unorthodox and perhaps suffer from not being clearly explained, or presented in an overly critical manner. Providing this unifying framework based on internal(contemplated) and external(historical) factors is precisely how a "psychosocial" model fits into art history. Modern cognitive sciences have moved on from the archetypes established by Freud and Jung - art history must also move on. Psychosocial considerations are not an esoteric intellectual concept, they drive the modern study of human behaviour and inform global initiatives in health, including response to epidemics and emergency relief. Just as a human behavioural specialist will study the science of the brain, to supplement and inform their case work, art history must learn to incorporate the facts scientists and historians provide, whilst reconciling the internal motivators for human creativity. Each of these processes informs the other - the only error would be to view them as conflicting, or juxtaposed viewpoints, rather than different facets of the same entity. One does not require a grounding in psychosocial theory to be able to apply this to art history. It can be reduced to two basic questions - which nicely complement Panofsky's third level of meaning. *What does the work tell us about the artist? *What does the work tell about the subject? Jan van Eyck executed this piece in oils on wood panel. His technique involved detailed underdrawing of specific segments, with pigments and glazes arrayed in layers to create a highly finished, visually realistic effect. Scientific analysis of the panel, and constituent pigment and ground layers demonstrated chemical factors consistent with other pieces from the period, including works attributed to this artist. 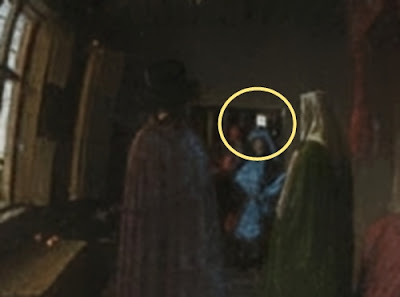 There is a degree of textual and empirical evidence to suggest Jan van Eyck could have employed optical devices, such as mirror and basic lenses, frequently depicted in his works, as an aid to composition. In the case of the Arnolfini piece in particular, this is suggested by the modelling of the chandelier. A hint at this process, simply achieved(and reproducible) with a focused beam from a prominent light source, is possibly suggested in the image shown in the convex mirror central to the piece. The central, convex lens of the painting is an analogue for the eye, in this case the artist's eye. The reflection it offers presents the subjects in a distorted, parted aspect, revealing two figures in the doorway. One of these figures must surely be the artist himself, who proclaiming his presence boldly with a signature above the mirror, boasts to the ages of his skill at capturing a realistic image, just like the convex mirror he inhabits. Each listed viewpoint is important - arguing the merits of one over the other is not fruitful. Only by combining them under a unifying framework can you arrive at a deeper appreciation of the piece, its worth to the artist, and its value to its patron. As a final comment, it is imperative to point out that despite seeming modern, the idea of a more complete approach that encompasses the arts, sciences and philosophy is hardly new. Among the earliest surviving descriptions of the arts in the West, seen in the works of Hellenistic and Roman writers are notable examples representing a state of mind which embraced and unified processes of inquiry. This persisted in the Byzantine and Eastern Cultures in different forms, but re-appeared in its more familiar classical guise during the Early Modern era, in works such as Leon Battista Alberti's De Pictura. The term Renaissance now equally describes someone who embraces many disciplines, as well as being a descriptor of a rebirth of classical ideas. The fostering of this more informed, well-rounded and reflective approach to the arts and sciences has great implications for teaching, and highlights the value of diversifying skills in an increasingly competitive job market. Fried, M. The Moment of Caravaggio. Princeton University Press. 2010. Panofsky, E. Studies in Iconology: Humanistic Themes in the Art of the Renaissance. New York: Harper & Row. 1972. pp.5-9. Zanker, G. Modes of Viewing in Hellenistic Poetry and Art. University of Wisconsin Press. 2004. Hi H! Great ideas! You do well to point out that Koster's argument still aligns with some Panofskian methodology. Even though Koster doesn't agree with Panofsky's overall interpretation for this painting, she is indebted to Panofsky's methodologies. Koster wouldn't have been able to come up with her iconographic interpretation without Panofsky to lay the groundwork. I think that the art historical discipline (and the Western mindset in general) might focus a bit too much on ingenuity and improvement. In other words, art historians feel pressure to improve on the current discourse (even if that improvement means a rejection of earlier ideas). Perhaps an ideological shift away from this trajectory of improvement/ingenuity would also result in the more unified framework of which you speak? Cheers for the comments M! I too was struck by how much Koster seemed to take from Panofsky, without openly acknowledging it, instead labelling his work as a misconception or manifesto. In the acknowledgement section she heaps praises on Campbell, whose work is similarly based on expanding Panofsky's concepts. I wrote this post to highlight this and to give examples of how a number of different disciplines and viewpoints can contribute to a bigger picture in understanding works from the Renaissance in particular. I was just amazed how small this painting is when I saw it - that picture is almost life -size! You are very lucky to be able to go and see it at any time Juliette! For those that haven't seen it - the actual dimensions of the piece are 82.2 x60cm. It is so gratifying to see anyone still remembers the Apollo article, let alone writing in a way that encourages others to follow. Thank you. For what it is worth I agree that I owe an enormous debt to Panofsky, Campbell and others and could have done little more than admire the artist's skill without their earlier, far more important contributions. Standing on the shoulders of giants. On the other hand, I think it is also good to publish accounts that point to mistakes, which we all make -- some of us more than others -- and on this painting I do believe considering who the portrait depicts and why and when it was painted are worthy pursuits that may make the painting more interesting or even moving for some, bringing a distant time and place closer. There are many great published accounts of this work; the best, I believe, consider the known facts, such as they are. The tradition of starting an art historical account with a combatative stance is tough to overcome, but an effort worth making. I regret any perceived slight to Professor Panofsky, whose work towers above most others. Ps ...most obviously my own! @M. Koerner - many thanks for the contribution - what a great honour! That famous Newton quote is very apt - I was introduced to art history via Panofsky in an unusual manner - having found a copy of a book of his on the ground at age 9! Despite constantly reading it, I had very little grasp of what it was until much later. Yet even at that very young age knew my battered copy of Meaning in the Visual Arts contained something quite special.